The Panathenaic Stadium looking splendid at dusk. The restored, 2,500-year-old monument – a jewel of cultural heritage – stands apart as the world’s only all-marble stadium and the only to host three Olympics. To escape the midday heat, the philosopher Socrates and his pupil Phaedrus decided to venture out to an idyllic area outside the city walls. There, beneath a towering plane tree, the pair conversed about love and hate – as Plato, Socrates’ disciple would later describe, transforming their dialogue into his play Phaedrus. Beside them, the waters of the Ilissos River rolled gently by, flowing past temples, altars and shrines. The orator Lycurgus was elected for four years as Curator of the War Fund, a post he would keep for another two four-year terms after he managed to more than double the government revenues of the city and find money to build grandiose public works projects. The Panathenaic Stadium was created under his supervision, built in the sacred riverside spot close to Ilissos where Socrates and Phaedrus had sought quiet and shade. Athens now had an appropriate venue for sporting competitions held during the Panathenaic Games, one of the city’s great celebrations. The stadium would be used for the first time in 330/329 BC. A ravine between two hills was deemed the ideal site. Significant excavation work was carried out, transforming the natural cavity into a space for athletics, while the “theater,” i.e. the area for the spectators, was hewn into the surrounding clay slopes. The stadium had a rectangular shape, the typical form of ancient Greek stadiums also seen at Olympia and Epidaurus. The land on which it was built belonged to Deinia, who gave it to the city, while the exorbitant construction costs were covered by major donations, such as the thousand pairs of oxen provided by Eudemus of Plataea. 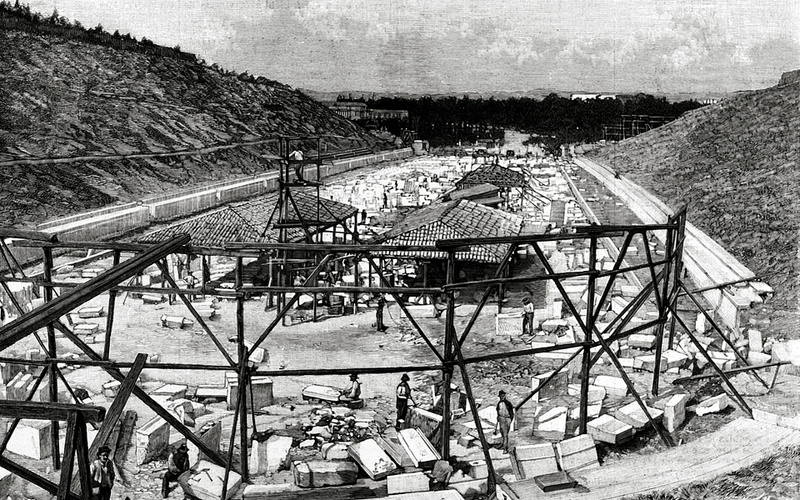 The Panathenaic Stadium was turned into a vast construction site during its 1895 reconstruction. In the foreground, wooden scaffolding used to place the marble. Treasures of the Panathenaic Stadium, these two double-sided herms from the 2nd century AD were discovered during the 1869-1870 excavations. 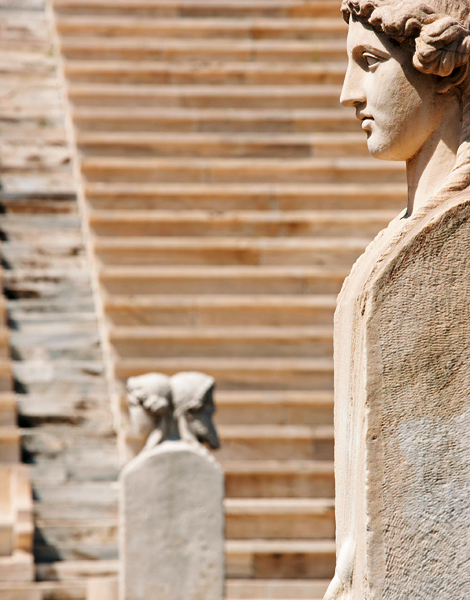 During the period of the Roman Empire, Athens was not a political power. However, for the duration of Emperor Hadrian’s rule (AD 117-135), intellectual and artistic expression flourished; the city acquired new, extravagant buildings, churches and wealthy mansions with gardens beside the riverbed of the Ilissos. The stadium still had a plain dirt surface. Apart from sporting events, it also hosted animal fights, such as the historic event organized by Hadrian, involving 1,000 wild animals. Soon, however, the quarry on Mount Penteli, which had supplied material for the Acropolis monuments, would also provide its famous white marble for a complete transformation of the stadium, thanks to Herodes Atticus. The son of an extremely wealthy, aristocratic Athenian family, the orator and sophist Herodes was one of the major sponsors of Athens’ various public works projects. The most important were the famous Odeon of Herodes Atticus, on the south slope of the Acropolis, and the Panathenaic Stadium, which changed drastically in appearance after two significant innovations. 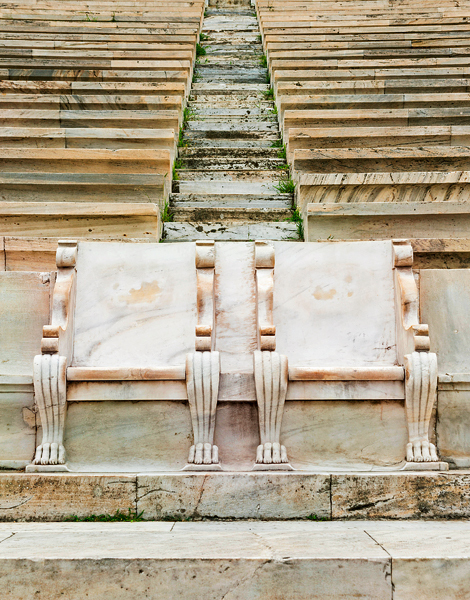 Firstly, its original rectangular shape of was adjusted to a horseshoe – typical of stadiums during the Roman Age – while the seating area for spectators was enlarged and veneered with brilliant Pentelic marble. Equally impressive was a three-arched bridge at the front of the stadium, which crossed the Ilissos and served as a monumental point of access for Athenians to make their way to the arena. Numerous marble statues also provided a lavish decor. The stadium’s capacity exceeded 50,000 fans and historians of the time wrote that it represented a marble “miracle,” a work that was incomparable to anything of its kind in the world. The Athenians, for their part, playfully teased that it rightly bore the name Panathenaic Stadium since it was built with money from all of the citizens. They were implying that, in financing the Stadium, Herodes had disregarded the wishes of his father Atticus for every citizen to receive an annual payout as a gift from the family’s vast fortune. The white Pentelic marble covering the Stadium from end to end is what gave the monument its nickname, Kallimarmaro, or beautiful marble.Α true gem in the heart of modern Athens, the gleaming Panathenaic stadium hosts cultural and sporting events, as well as being one of the country’s most popular tourist attractions. 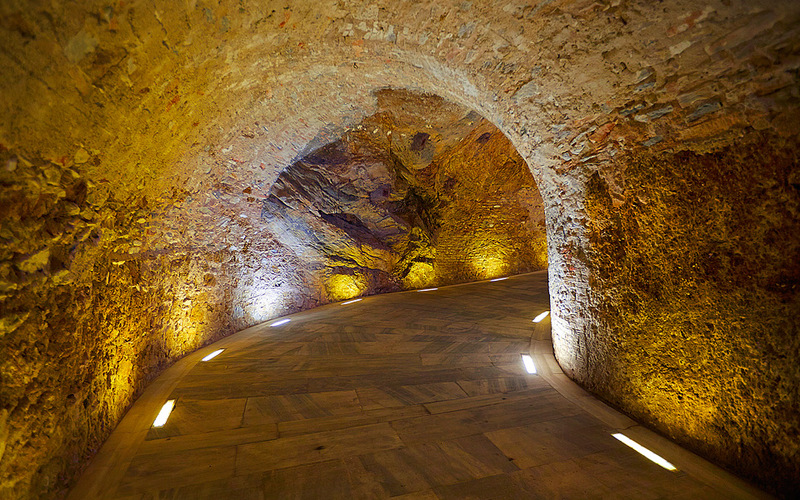 The underground passage, used by athletes to enter the racetrack, is believed to have been opened when the stadium was originally built in the 4th century BC. Athens 2004 Olympics: Italy's Stefano Baldini crosses the Marathon finish line for the gold, with a time of 2:10:55.4. After centuries in the doldrums, the stadium returned to the spotlight in 1896 when it was decided that it would host the first modern Olympic Games. The reconstruction costs were far too high for the country’s own coffers, however, as the stadium was covered by tons of soil and had long ago been stripped of its valuable marble – for reuse in the construction of other Athenian buildings. The entire cost was instead taken on by a Greek benefactor, Georgios Averoff; but on one condition: the stadium would be rebuilt exactly on the foundations of the ancient monument, which were uncovered thanks to an archaeological excavation. The architect Anastasis Metaxas took on the project. The reconstruction work became a race against time as it had to be completed in less than a year. In the summer of 1895, the stadium resembled a construction site, filled with stacks of marble slabs, wooden scaffolding, stone masons, laborers and sturdy horse-drawn carts carrying materials to and from 350 different mines. A total of 550 people were involved in the project. The snow that covered Mount Penteli at the start of 1896 made it impossible to fully complete the project with Pentelic marble, forcing the Hellenic Olympic Committee to cover the remaining parts of the Stadium temporarily with limestone statues and wooden benches. 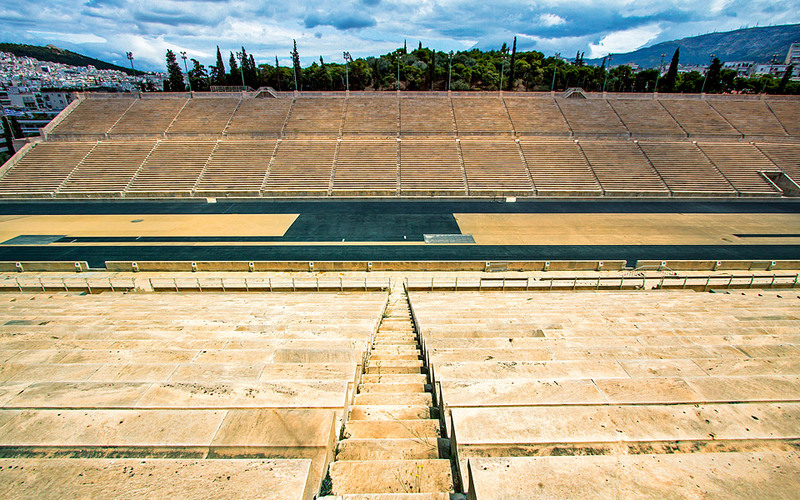 The Panathenaic Stadium hosted the inaugural international Olympic Games, making it the celebrated place where the Olympics were revived in modern times. By 1900, the stadium was covered entirely in marble, prompting its new nickname “Kallimarmaro,” or beautiful marble. The Greek state honored Averoff by erecting a statue of him to the right of the stadium’s entrance, just as ancient Athens had honored Herodes by placing his tomb at the top of the hill to the left of the entrance. Athletes and spectators alike experienced moments of thrills and chills at the Panathenaic Stadium, which played host to archery and the finish of the Olympic Marathon. Α true gem in the heart of modern Athens, the gleaming Panathenaic Stadium hosts cultural and sporting events, as well as being one of the country’s most popular tourist attractions. • It is the only stadium in the world made entirely from marble; the same brilliant white Pentelic marble as the monuments on the Acropolis. • It is the only stadium in the world that has hosted three Olympics: the inaugural modern Olympic Games in 1896, the 1906 Games, and events during the 2004 Olympics. • The word “stadium” derives from stadion, the unit of measurement used by the ancient Greeks to mark out where competitions took place. The stadion was 600 feet, with each foot being 0.308m. 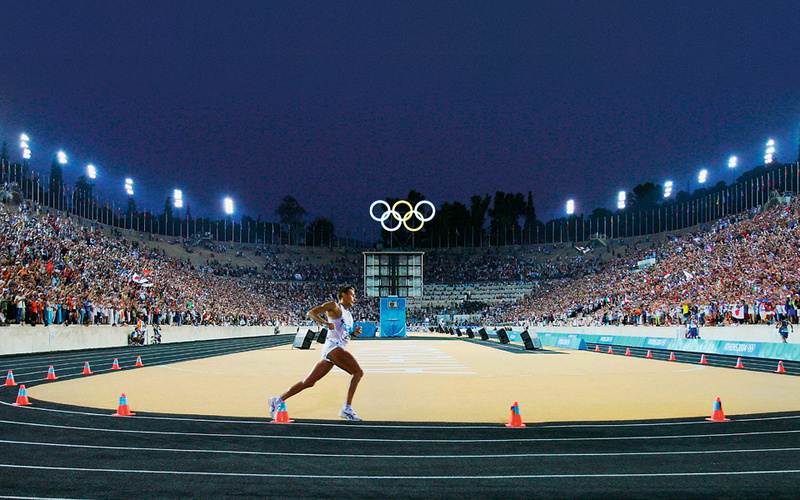 Thus, the total length of the Panathenaic Stadium is approximately 185 meters. 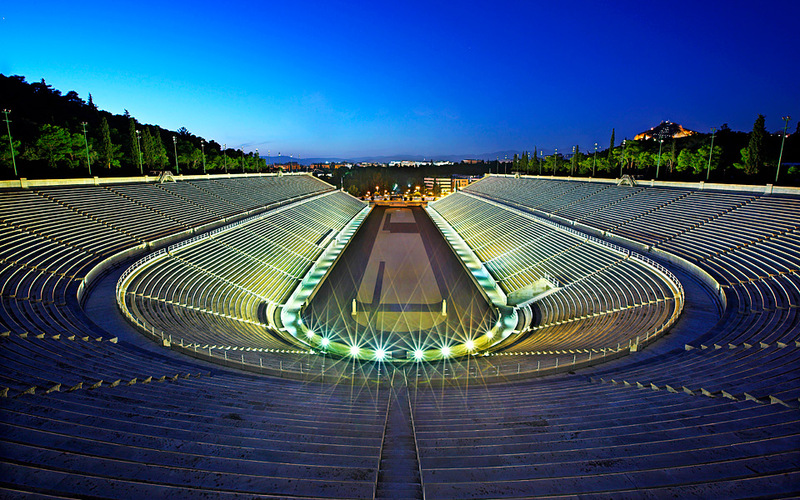 • The Panathenaic Stadium was reconstructed for the 1896 Olympic Games. The enormous cost, which was deemed unaffordable for a state which only three years earlier had declared bankruptcy, was covered by the Greek benefactor Georgios Averoff. The total cost came to 907,973 drachmas, a very significant amount at the time. • The finishing line for the Marathon, the most important event of the first modern Olympic Games, was laid out in the stadium. A crowd of 80,000 spectators spent a long and increasingly tense afternoon waiting for the runners of the Marathon. The man to enter the stadium first was the Greek, Spyros Louis. • The stadium is built to host up to 50,000 spectators. The two tiers are separated by an aisle at the 23rd row and the rows are intersected by 18 staircases, forming a total of 30 stands. • The Panathenaic Stadium was depicted on the Olympic medals awarded in Athens in 2004, in Beijing in 2008 and in London in 2012. It will appear again this year on the Rio medals. Monuments are more beautiful when they come to life. Every autumn at the Panathenaic Stadium, you can experience the festive atmosphere of The Athens Authentic Marathon, either from the stands, along the route, or by participating yourself in the most important international sporting event in the Greek capital. It’s not often that we get to enjoy a concert at the stadium, but when it happens, it’s an event in itself (Depeche Mode, The Cure, The Stranglers, Run-DMC, Culture Club, Bonnie Tyler, Joan Jett and REM are just a few of the musical acts that have rocked the venue). Because of the marble, temperatures in can get quite hot in the stadium during the summer. The best hours to visit are early in the morning or late in the afternoon, when temperatures are lower. Bring along a bottle of water and sun protection. In winter, care is advised on the steps, especially during rainy weather. If you want a panoramic shot of Athens, you should climb to the highest row of stand 21, where you can see the Acropolis, the Parthenon, Filopappos Hill, the Temple of Olympian Zeus, Zappeio, the National Gardens and Lycabettus Hill. For a perfect “selfie,” stand on the podium against the backdrop of the stadium. If you’re feeling energetic, you can go for a run around the stadium, following in the footsteps of great athletes. Running shoes are required. Athenian runners love going for a jog around the horseshoe-shaped track just outside the top of the stadium. The running track is open from 8:30 until sunset.